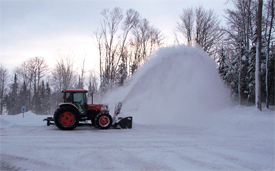 Eastern Upper Michigan Snow Removal Services for Paradise, Whitefish Point, Pike Lake, Two Heart Area, Newberry, Eckerman, Trout Lake, Brimley and the surrounding areas. Jim has been in the Snow Removal Services business for 18 years. He has provided these services for home owners, schools, businesses, & vacation properties. Commercial, residential, or the winter weekend get-a-way call Jim today! Jim and his team provide the Eastern Upper Michigan with quality Snow Removal Services - Let us help you keep this winter - worry free! 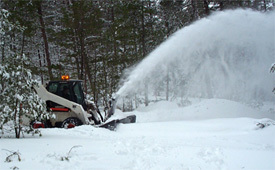 As shown in the pictures, we have the equipment to make snow removal easier. We work with big equipment to move the big snow that the Eastern Upper Peninsula often accumulates. "Just a quick note to express our sincere appreciation for the great job you are doing removing the snow from the school yard. Your skillful work, dedication, and attention to detail are greatly appreciated. You really work hard at making sure the schoolyard is cleared not only for the day-to-day school dealings but also special evening and weekend events. We have received many compliments regarding the ease of access/egress from the parking that speak to the quality of work you do. The buses are able to get in and out without a problem, much to the disappointment of some students. Thanks again!"